Describe how light is measured for effectiveness and sustainability. Identify the physiology and biology of vision. Define the types of bathroom lighting. Explain the emotional impact of lighting on moods. Discuss bathroom lighting for special situations. Our days begin and end in the bathroom. It is where we energize for the day and calm down in the evenings, which means that the ambiance of a bathroom has a decisive impact on a person’s well-being. Despite this fact, light in the bathroom remains an area that is underestimated or treated as an afterthought. However, when reflective surfaces, lighted mirrors, and warm or cool LED lighting are added, the bathroom becomes alternately rejuvenating and relaxing for morning and evening. This course explores the potential for LED bathroom lighting for occupant well-being, and helps architects and designers specify LED lighting for sustainability, occupant health, and safety, and to appeal to the emotions. Founded in 1817 in the heart of the Black Forest, Duravit is a leading manufacturer of ceramic sanitaryware, bathroom furniture, whirlpool tubs and wellness products. Duravit’s collaborations with internationally renowned designers such as Philippe Starck, Norman Foster and sieger design yield forward-thinking, environmentally-conscious and award-winning products that bring the bathroom to life. 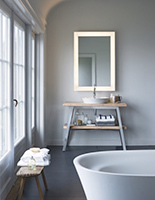 For more information please contact Duravit USA, Inc.: 888-DURAVIT or www.duravit.us.